Kids Love Greece is proud to announce a special partnership featuring “3D family friendly tours with tablets”, an innovative touring tool when visiting archaeological sites such as the Acropolis in Athens, The Palace of Knossos in Heraklion (Crete), Lindos in Rhodes as well as Olympia in the Peloponnese. What is the “3D family friendly tour with ipads”? Once you enter the archaeological sites, you will be given a mini ipad which is loaded with the monument’s augmented and virtual reality app. By moving the tablet around, the user is able to see the exterior and interior of the temples as well as all the amazing statues. Why shall I do the “3D family friendly tour with ipads”? The 3D app is very unique. It will feel like a virtual time traveling gadget and you will feel you have become part of the glorious era of the ancient Greek history. You will be able to view the monuments, statues etc in their original shape (fully reconstructed) i.e. as they used to be thousands of years ago. You will also be able to open virtual doors and enter rooms that are not open to the public e.g. the Throne Room of Kind Minos at the Palace of Knossos. 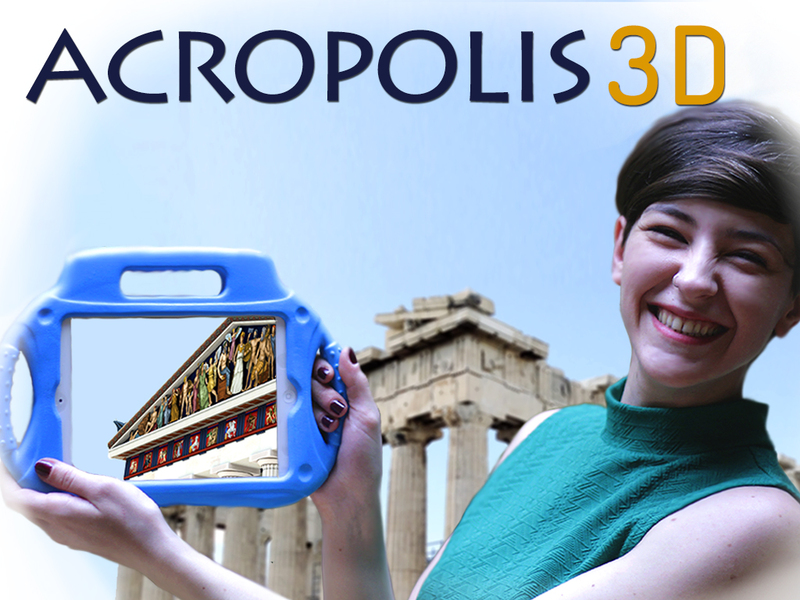 You can also “test” the app by clicking here: https://www.youtube.com/watch?v=-x_8hOD2ado&feature=youtu.be If your mobile has a gyroscope watch the video from the YouTube App and see Acropolis reconstructed all around. Step 3: Once payment will be received, you will be sent the 3D Tour Voucher. Step 4: A representative of Moptil, the app developer, will deliver the tablet to you in the archaeological site at a pre-specified time. Ideally, we need at least 3 working days for Steps 1-3. What do I need to have with me in order to get the tablets? You will need to show to Moptil’s representative the 3D Tour Voucher. You will also need to leave your Passport or ID Card as a deposit, which will be returned to you at the end of the tour. You will need both items 1 and 2 so as get your tablets from Moptil’s representative. Will I have a licensed guide with me while using the app? No. You will not have a guide as this is not a guided tour. The Moptil representative will show to you how to use the tablet, however, he is not a tour guide. The app has visual effects but there is no narration nor any accompanied text. By no means, the app should be seen as a substitute to a tour guide since there is no narration. We highly recommend that you use the app as part of a private tour with a family-friendly guide who is trained to use the app. If you are interested in doing a private guided tour, please fill in the form accordingly. It costs EUR15 per tablet. How many tablets shall I reserve? We recommend that you book one tablet per family member, however, it is up to you. For how long can I keep the tablets? We highly recommend that you use the tablets as part of a private guided tour. Are you interested in hiring a private family friendly tour guide? Is there anything else you would like to tell us about your trip?